On September 3, 2014, the TD Go per-day reload amount will be decreasing from $1,000 to $500. The maximum card balance at any time will remain at $2,000. In addition to that account owners and friends and family members will only be able to load TD Go Card(s) using a TD Bank Debit or Credit Card, or by direct deposit. In short, this card is basically dead to the travel hacking community. As of 8/29/14, the US Buxx link is officially dead. My Visa Buxx post has arguably been my most popular post. Because of that, I’ve been asked certain questions about it, multiple times. The purpose of this post is to consolidate those questions and answer them for everyone. Are you sure the teen section isn’t verified? What credit cards can you load Visa Buxx with? This card can be loaded with Citi credit cards. They do not code as cash advances. I would still message Citi and have them lower your credit card cash advance line to $0, though. Don’t load with a US Bank card, it will not earn you points. Citi codes as a purchase, so you can use those. Don’t load with a Citi card, it will code as a cash advance. Filling in the teen info is simple. They don’t verify it so you could put anyone’s name, email, phone number, and social security number. When my wife and I signed up for accounts, we used each others info as our “teens”. So, I am her “teen” and she is mine. Are you sure the teen section isn’t verified? Yes, but that doesn’t mean you won’t get shut down for it. My experience so far has been nothing but perfect. However, there have been reports on Flyertalk of people getting shut down. The US Bank cardholder agreement says that the person signing up (you) will notify them of the name, age, relationship, and address of your “teen”. The only requirement is your “teen” must be 13 years or older. Mastercard and Visa. No Amex sadly. Also, be aware that Citi codes as a purchase for TD Bank and US Bank, but not for Nationwide Bank. US Bank stopped accepting new sign-ups in February, however, there is still a hidden sign-up page. That is the link posted above, so I would suggest signing up ASAP, just in case they close the hidden sign-up page as well. This Flyertalk thread dedicated to Visa Buxx is over 10 years old, so if you are looking for any info regarding the Visa Buxx family, that’s a good thread to look in. Otherwise, leave your question below and I will add it to this post. What’s the best option to liquidate Buxx funds? I like to liquidate my Buxx via the ATM, because it’s completely free. If that’s not an option, money orders are my second choice. You list max ATM amounts… how does that relate to using a Buxx card say for loading to BB or GoBank? You could load Bluebird, Serve, or GoBank with it, but I don’t like to solely because I don’t want to waste my $5,000 monthly limit. This doesn’t affect your ATM withdrawals. It would affect spending your spending limits. If I have access to a TD bank, would a TD Buxx card be free of ATM fees? Yes, TD Buxx can use TD ATMs for free. The only problem, is your limited to a $60 withdrawal per week. It would take quite a while to liquidate that way. Can you load with gift cards? 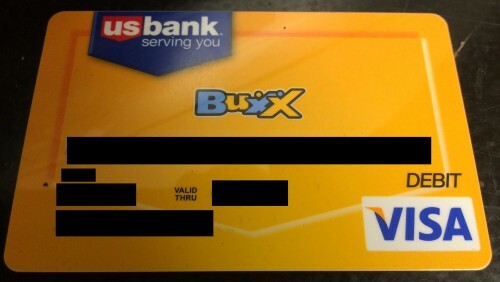 Buxx cannot be loaded with GCs, only credit cards. Can you purchase money orders? You can purchase MOs with Buxx. They will code as purchases when bought at Walmart or grocery stores. What amounts can they be purchased in? The MO amount will vary by store. Walmart is $1,000 for $0.70 and most grocery stores are $500 for $0.60-$0.75.